If there’s one thing that can band us Filipinos together stronger than any political or religious affiliations can ever try to tear us apart, it’s food. To celebrate this love for food, here are 10 of the many food parks we have all around the metro, from North to South, through East and West. No matter where you may be in this tattered, ol’ city, you can find comfort in a good meal, made even better by great company. With over a dozen food stalls waiting to serve you, there’s no shortage of delectable treats to satiate your hunger. There’s Hawkers if you feel like going for some Singaporean meal, Jack’s Joint for some pizza and other Mediterranean dishes, and a host of other establishments serving Filipino food, such as La Calle, Volcanic Plate, or Wrecking Ball. They also have American, Chinese, and Japanese cuisine, so there really isn’t anything to worry about when it comes to choices. The best part about all this: the budget-friendly price. Your P80 can go a long way here, particularly with The Braw Barn’s Basic B quarter pounder burger. Wrecking Ball, meanwhile, is all about them balls, so if you’re really on a tight budget, drop by their stall and get a quick a la carte fix of balls (fish, shrimp, chicken, crab), fish sticks, kwek-kwek, kikiam, and more for as little as P49. This one’s got a lot more variety, thanks to the 20+ food entrepreneurs sharing their love for food with all the rest of us. From sandwiches to burgers, shawarma and kebabs, grilled meat, desserts, drinks, and more, name it and they’ve got it. Meanwhile, cheese lovers will find themselves particularly gravitating towards Cheese-o-Holic, with their mouth-watering cheesy menu. A Ham & Cheese sandwich goes for P160, same as the Three Cheese Sandwich. There’s also a Mini Cheese Platter (P250) and a Cheese Fondue Platter (P445) in case you want things uber cheesy. Oh, and if you want to try that super trendy Raclette cheese, now’s the chance cos they have it here for only P395. Because cheese is life. The establishments in StrEat may not equal in number as the others, but they are very well curated. They have a carefully chosen selection of dishes, including Turkish Cuisine via Bricks and Copper, burgers from G.R.Eat Burger Truck, and more American hotdogs and sandwiches from Schmidt’s Gourmet Hotdogs. This is a good place to go to if you’re craving sweets, or would just like to soothe a bad day with pastries and desserts. The Lost Bread, Black Sugar, Magpie Cafe (try their Bingsu! ), and Endless Summer Cafe are here to turn that frown into a smile. Enjoy bucketfuls of seafood at Buckets to Go. That would definitely go great with a bucket of beer, as well as a side order of nachos and fries. Another establishment to look forward to is Tata Boy’s Boodle Fight. If you’ve never tried eating the boodle way, this is a great opportunity for you to finally do so. A typical meat boodle includes liempo, longganisa, itlog na maalat, freshly grilled tomatoes, green mangoes, bagoong, atchara, and of course, rice, rice, rice! A 2-3 person serving is served for P599, while a bigger 4-5 person serving is at P899. Madison also happens to be the home of Big Guys! Pizza, the famous 36-inch pizza. For coffee and tea connoisseurs, there’s Nitro7 Coffee and Tea Bar, which also should be perfect for calming your tummies after all those heavy meals you’ve just had. Almost two dozen establishments are ready to serve and fill you up to ward that hangry feeling away. 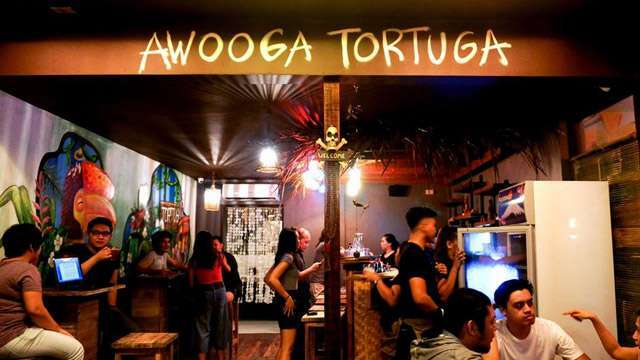 There’s no shortage of Filipino dishes served here, from Fire Station’s grilled specialties to the classic Filipino tapa from Tapsi Turvy, and everyone’s favorite pairing for beer, the unmistakably Filipino dish that is sisig from Kapit Sisig. This is actually the second branch of The Yard, with the first one having opened in Xavierville last year. Obviously, that park proved to be enough of a hit to convince its creators to bring it over to Pasig. For this branch, expect to see more of the London Underground inspirations that the founders based their concept for the food park on. The Yard markets itself not only as a place to get some grub from their whopping 30 food stalls, but a chill haven where you can catch live performances from bands and DJs. Pound4Pound is there to satisfy your burger cravings for as little as P180, while Pub Express impresses with their P169 Baby Back Ribs. There’s also Ta Ke Ho Me Sushi for your Japanese cravings, Halal Kabab for halal Persian, and Above Sea Level for their awesomely ginormous Super Giant Butterfly Squid (P250). At Carnival Food Park, they don’t just want to serve you food—they want to make sure you have an utterly good time. 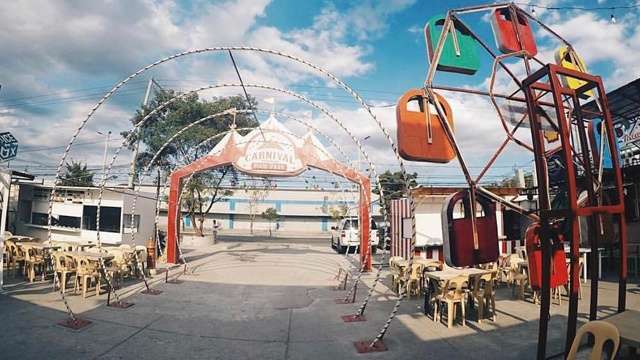 That’s why in their 1,600+ square meters worth of food park space, they’ve allotted an area for fun and games to fit the concept of a carnival. Basketball shootouts, KTV rooms, and live music are there to keep you busy. The idea of the investors was to combine as much of the things that Pinoys love in one spot. In this case, it’s basketball and food. Food by the Court sits conveniently beside a refurbished basketball court, which is definitely a smart move considering how hungry both players and fans can get after an intense game. You don’t need to be a fan of the sport to enjoy the food. Our favorites: Mad Subs for the epic sandwiches, and Little Kodo for a delish slice of Japan. Each space has a specific theme, with Earth being the Ground level, and then the second floor being Sky, and, and the third being the Galaxy. The Earth space offers Egg-It, which is also a mainstay in other food parks, such as StrEat: Maginhawa. This is perfect for those hankering for some Hong Kong-style treats, like waffles topped with all sorts of toppings and ice cream. You can also have grilled meats from Sticks and Smoke, comfort food from Ilocos through Ok.nom, and Persian-Filipino dishes from Golestan. You can find more flavors up on Sky and Galaxy, including sizzlers, uber-sinful milkshakes, and yes, their glow-in-the-dark beer pong table. Container Turf literally just opened their container doors. It’s the first one in the south, though, so for sure it’ll get everyone excited. Some of the things to look forward to are the Mac n’ Cheese burgers from GrilledXChilled, fall-off-the-bones ribs from Jurassic Grill, and some Korean street food faves from Noona’s.